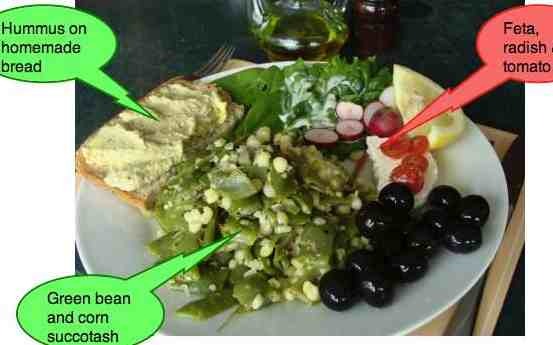 Succotash recipe is corn and beans with a difference. I'm sure you too have odd strange memories from you childhood that spring uninvited into the conscious brain. I had one this week: creamed corn succotash. I even remember the name, though it's fully fifty plus years since my father's sufferin succotash passed through my lips. Such was the power of it. This page was last updated by Bernard Preston on 27th January, 2019. The common South African lima bean is perfectly horrid. Hard, starchy and tasteless. 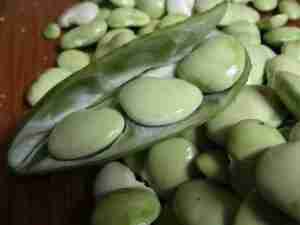 It's white with pink stripes, whilst I love the bean family, from childhood I couldn't stomach our first limas. Then Papa, when I was about ten years old, went to visit his father in Pine Beach, New Jersey. And came back with a highly contraband packet of lima bean seeds. Little pale yellowy green beans, I still remember them like it was yesterday. Into the garden they went, along with a couple rows of Hickory King, our favourite corn. Three months later, aged still only ten, I had my first creamed corn succotash. I still remember it like it was yesterday. I suppose we enjoyed it a few times, and then pah, no more. Papa cuckolded another man's wife and that was that; no more succotash recipes; and a few other things too. The succotash recipes that my father initially made from the pink variety, canned I think, were absolutely ghastly. Flavourless, starchy and mushy. I remember them well. And then the smuggled-in green American lima beans, fresh from the garden together with our own corn. Yum! Oh, one other thing! I was made to sit on the verandah with a large bowl of pods and forced to shell them. Now that wasn't fun, but in retrospect, since I love tasty food, it was worth the effort and brings back such happy memories. Quality food usually requires some effort. Succotash recipe is a wonderful healthy way to boost your vegetable protein with low GI ingredients. If all members of the family have disgustingly low cholesterol, then add 1/2 cup light cream. Otherwise a little butter. Actually the fat increases the absorption of the phytosterols. Growing lima beans has a long season but is otherwise without many difficulties; or get them from a can; they are an essential ingredient of your succotash recipe. By whatever means, shell your lima pods. It's usually easiest for two people to do make succotash recipes together. One cuts off the thin edge of the pod with scissors, whilst the other pops the beans out. Better still, call the grandkids. We have a lovely time together. I crack the shell, and they go eagerly hunting for the beans. Pour a cup of boiling water into a pot, and bring it again to the boil. Add the beans, place the lid on the pot and bring it to hard boiling. If necessary add some boiling water so the beans are just about covered. Leave the lid off for a few minutes so that some of the water can boil off, and then replace the lid and simmer until tender. About fifteen minutes depending on how old the beans are. When tender, drain the limas, keeping the water for the corn, or mealies as we call them in South Africa. 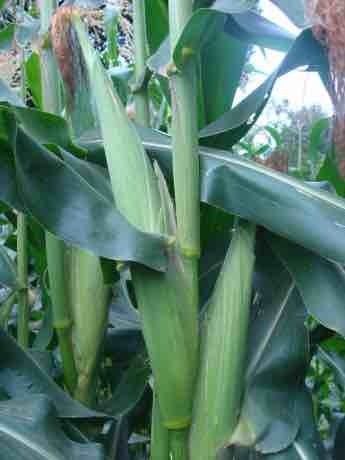 How to grow corn also needs a large garden; it's for those only who are very fortunate. Actually, it's more about the choices we make. These beauties are three months old and as you see we are about to enjoy our first succotash recipe. Bring the lima water back to the boil, and add the young mealie cobs and boil them hard for about five minutes. Allow the corn to cool sufficiently so you can cut the kernels from the cob. Use a sharp knife. Toss the limas and corn kernels into a pot and add the cream or butter, salt and pepper, and perhaps a slither of finely chopped chili and garlic. Even a few slices of radish to give it a bit of spice. Bring gently back to the boil, stirring, and serve either as a side-dish or main meal. It's delic with fish, scallops or shrimp, if you're not a vegetarian. 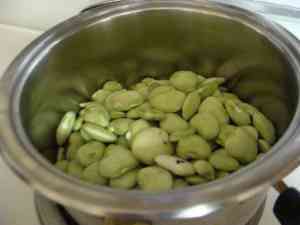 Drop the shelled lima beans into boiling water. Drop the ear of corn into the pot. Bring back to the boil for another five minutes. Cool the cob and slice off the kernels. Meantime, in another pot add goodly chunk of butter, on low heat add the jalapeno, garlic and cooked lima beans. Add the mealie kernels and simmer gently for a few minutes, adding salt and pepper to taste. Enjoy. Add a couple tablespoons of cream if your cholesterol is in order. Actually, if you're eating foods like this, and following the dictates of exercise and cholesterol, you need have no fears of that bogey. 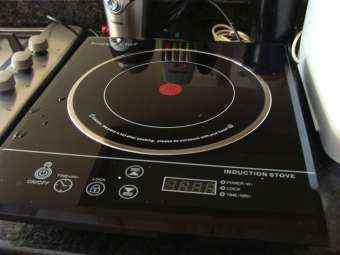 We use an induction stove because it's twice as fast as gas, and uses half the electricity of a conventional element. Both corn and lima beans have a low glycemic index cooked in this way. Although they are fairly high in starch, the sugars are slowly released in the blood stream without producing an insulin rush. What helps in particular is the protein in the beans - that keeps the total GI low. If you are seriously overweight then this dish is not for you. The best way to lose weight is to cut out the starch in your diet altogether. Nevertheless, despite Bernard Preston's protestations that this succotash recipe is made solely from low GI complex carbohydrate, all of the ketogenic diets would frown on this healthy food. It certainly has not affected my cholesterol, blood pressure, glucose or HbA1C, the measure of insulin intolerance. It's chocolate cake that makes us obese and turns us into diabetics. I got this recipe from my New Jersey cousin, and for me it's still untried. I have such good memories... but fifty years is a long time. She sent some green lima bean seeds in the post and they are already about 3" high. It's a little late in the summer to be planting pole beans, but I'm keeping my fingers crossed. We'll be posting photos as they progress. Meantime, the corn is in full flower. Corn on the cob, one of my favourites. From the can, or made into cornflour it's high GI, but from the cob it's low GI. Good stuff. I've put up a scarecrow and so far the vervet monkeys are staying well away. Update: Well here they are, and what an enormous crop we've had. The only problem is that vervets raid regularly, and stole all our sweetcorn. So just plain lima beans, very delic straight from the garden and disgustingly healthy. 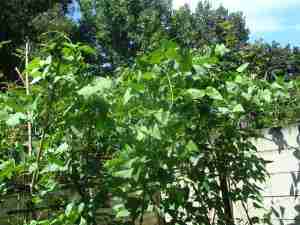 See at the bottom of the page for the link to growing lima beans. Update 2: This year I bought a paintball gun. I only hit one big male, and now they stay away. This year we've had wonderful sufferin succotash. Which ever way you do it, good healthy is about more legumes for protein; meat is good and healthy for us omnivores but we eat too much of it at our peril. 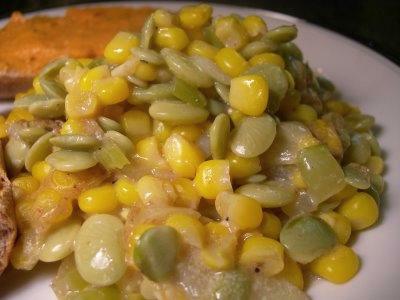 Grandma would certainly know about succotash recipes; they were probably daily on the menu in late summer when the corn was ripening and the lima bean pods were bulging with great healthy protein, to go with the carbs. Add butter or cream and you have a complete dish. There is great concern about cholesterol these days, and rightly so. But those who enjoy their organic green foods daily, sufferin' succotash in season, with butter or cream, need have no fear of the dreaded cholesterol lurgy. And in fact your homocysteine levels are far more important than cholesterol. Read the H factor. And that's dependent on plenty of greens and eggs for B12. You don't have disgustingly low cholesterol? Now doesn't that sound more sensible than taking statins. 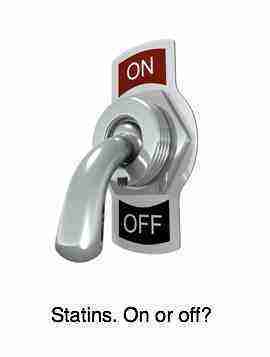 Apart from aching legs, this is one of the known side effects... an awful affliction for any man; and his wife! "Don't eat anything your great grandmother wouldn't recognise as food." We've had a poor crop this year; a combination of a severe drought, with late planting, and low summer temperatures has meant they haven't done well; alas the creamed corn succotash recipe will have to wait for next year. Incidentally, the carotenes in corn and beans are better absorbed if there's also fat in the dish. So either add butter later, or cream it. A more healthy way would be to add an avocado dish like guacamole on the side; delicious with succotash. The year is 2016 and we have a perfect crop of corn and lima beans. Soon we'll have some photos of our succotash recipe for you. Healthy choice foods give you an even chance of reaching old age with your marbles and even joints intact. Add to that exercise for the body, and stimulation for the brain and ninety is not out of the question; corn and beans like this succotash recipe is part of the deal. They are rich in lutein and zeaxanthin, two phytochemicals that prevent macular degeneration. Bernard Preston is a semiretired chiropractor who doesn't like pain, or taking drugs, and is prepared to make the changes to ensure that. That means plenty of exercise, chiropractic adjustments for aching joints, healthy choice foods and taking the time to make succotash recipe and contemplate the meaning of life. We are Christians and worship in two venues. One is the little Anglican church around the corner, and the other is the Garden Cathedral, where Adam first fellowshipped with God, remember.